The Advisory Committee met monthly from November 2016 to March 2018. They provided guidance and direction for the Forward 2040 Comprehensive Plan. Meeting packets are found below. Canceled. Please attend our town halls! Celebration and discussion of next steps. 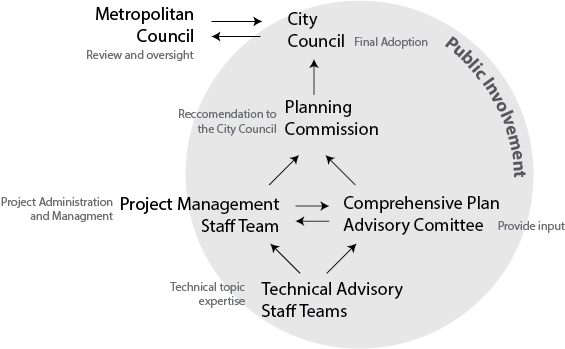 How does the Advisory Committee fit into the Forward 2040 decision making process? The Advisory Committee provides input to staff and the Planning Commission. The Bloomington City Council has the final review authority for Forward 2040. Over the next 2 years, the City of Bloomington will prepare an update to its Comprehensive Plan. While the Planning Commission has official review responsibilities and the City Council maintains decision-making authority on the Comprehensive Plan, input from a community-based Advisory Committee will be sought to ensure that a range of perspectives reflecting Bloomington’s diversity are factored into the City’s long-term vision and implementation priorities. The Comprehensive Plan, as required by State Statutes, must be consistent with the Metropolitan Council’s system policy plans and regional development guide (Thrive MSP 2040). The Comprehensive Plan provides policy guidance and sets priorities regarding development and provision of city services, programs, public infrastructure and amenities (e.g., roads, parks, sewers). Its scope is citywide and long-term. As such, the Advisory Committee will be asked to contribute a balanced and open perspective in considering a wide range of needs and wants in the context of restrained resources. This Advisory Committee is a time-specific, project-specific group charged with providing community perspective and insights on the policies and priorities embodied in drafts of the Comprehensive Plan. The Advisory Committee convenes for a period of 12-14 months beginning in October 2016. Local, regional, national/global trends and their implications for Bloomington over the next 20 years. Implementation priorities related to required plan elements (e.g., land use, transportation, utilities, parks, housing, etc.). Topics of discussion also include: potential approaches to achieve the Thrive MSP 2040 outcomes (stewardship, prosperity, equity, livability, sustainability); community values and guiding principles for decision-making related to public investment priorities. Consistent with Bloomington’s commitment to transparency, Advisory Committee meetings are open to observers who are not members of the committee. However, the meetings are not public hearings. While the Advisory Committee’s primary responsibility is to provide input to staff, a full record of their meetings will be provided to the Planning Commission and City Council. Except for business, institutional and service organization representatives, Committee members are Bloomington residents. Committee members are expected to: become knowledgeable about the project and its scope; listen to the ideas of others; express their points of view while working toward consensus; and contribute to the development of feedback that will assist staff in preparing the Comprehensive Plan update. Commit to attending a minimum of 10 of the 12-14 anticipated Advisory Committee meetings between October 2016 and December 2017. Abide by meeting protocols established at the first Advisory Committee meeting. Meetings generally take place from 6:30-8:30 p.m. on Wednesday evenings beginning in October 2016. Meetings are generally organized around a topic designed to allow review and input on all major elements of the full Comprehensive Plan over the course of the year. Meetings will typically be held at Bloomington Civic Plaza; however other venues may be used if deemed beneficial and appropriate. It is anticipated that the work of the Advisory Committee will be completed by the end of 2017, upon providing input on the draft Comprehensive Plan. The Committee’s input along with the draft Comprehensive Plan will be forwarded for review by the Planning Commission and City Council in early 2018. The Advisory Committee will be dissolved after its final meeting.